Rail fencing can be made from a variety of different materials from wood to vinyl, pipe, etc. 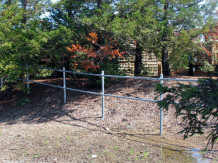 These fences are for several different applications including livestock, perimeter, garden, and residential fencing. Wood corral fences can be used for animal containment (usually large farm animals such as horses, ostriches and emus), marking property borders, or for decorative purposes such as a vineyard, orchard or rustic garden area. 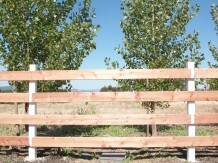 Wood corral fences are typically made with pressure-treated Douglas Fir posts. The rails can also be a variety of materials ranging from Douglas Fir corral boards, Construction Heart Redwood, and pressure treated poles to name a few. In this photo gallery we are showing you some of the styles we have done but we are always open to new ideas. Vinyl Post & Rail fencing provides a safe, reliable enclosure for horses and other livestock. There is no exposed hardware and the vinyl is tasteless, so the animals won’t gnaw or chew on it – so the protection for your livestock is second to none. It comes in two styles – Smooth texture or a CertaGrain wood-grain texture, which offers the authentic look of stained wood with the maintenance free vinyl. Our vinyl fence is virtually maintenance-free, eliminating the hassle of painting, scraping and sanding. Additionally you no longer have to worry about the ongoing costs associated with replacing warped or rotted sections. Ideal for all climates, and has unparalleled anti-fade protection from damaging ultraviolet rays. Many styles also include a steel-reinforced bottom rail for exceptional structural strength. 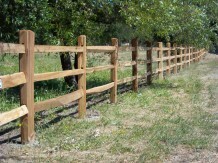 Western Red Cedar split rail is a particularly rough type of wood fence, creating a rural country look. Imagine it around a garden, a front yard or even as your perimeter fence. 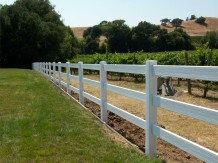 We have installed this type of fencing often for wineries to give them a rustic, old world impression. The sections come in two and three rail set-ups. We have some four rail examples in this gallery as well but they are more specialty orders. Galvanized steel pipe rail fencing is a simple and effective way to fence in areas and create corrals for large animal containment. It is a light weight pipe and is generally best with horses, ponies, llamas, ostriches, emus, etc.